Following on from the last two issues of the Leigh Journal which featured rare birds in the Leigh area, I sent them a photograph and some text about another very rare bird which was seen for just a few hours on Astley Moss on Sunday 20 October. 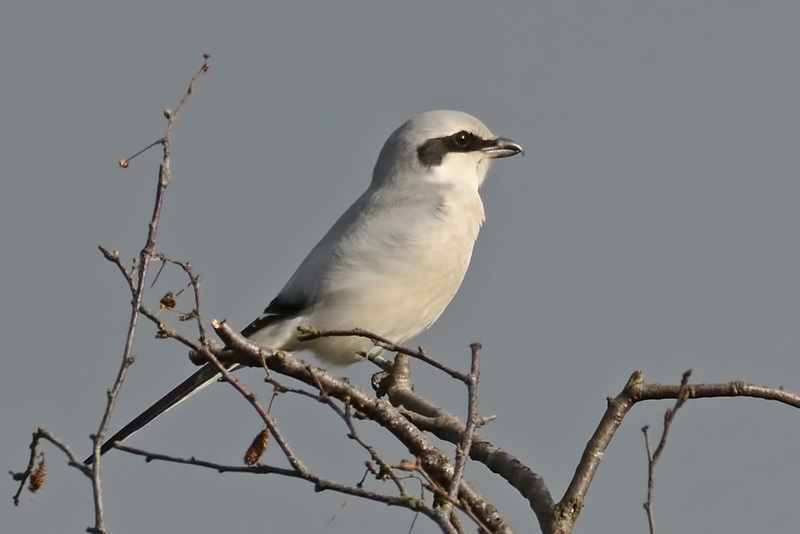 The bird, which is a Great Grey Shrike, was found by Dave Thacker who spends much of his spare time on the Moss looking at wildlife and the photo was taken by Jon Taverner, a local bird photographer who can be seen most days at Pennington Flash. When Dave found the bird he sent a text to the County Bird Recorder who then alerted many of the local birders. I was there within 15 minutes as I live in Tyldesley, and fairly quickly many of the birders already at Pennington Flash left for a quick dash down the East Lancs Road to Astley Moss. 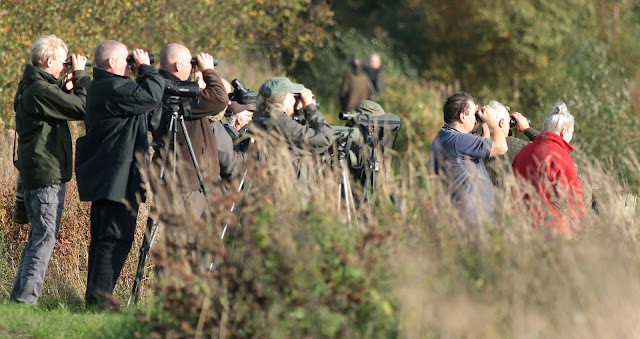 Soon there were at least 25 people looking for the Great Grey Shrike, which didn't disappoint those who turned up early. Unfortunately, it only hung around for a couple of hours and those who came later missed it. All Shrikes are migrants, within Europe or to Africa in winter. Great Grey Shrikes are regular but scarce visitors to the UK. They arrive on the east coast in autumn and many stay throughout winter and into spring (sometimes as late as April or May), when they migrate back to their breeding grounds in Scandinavia. The Great Grey Shrike eats small mammals, rodents, reptiles and birds as well as beetles and other insects. It often stores it food in a 'larder' for eating later by impaling it on a thorn. You can see from the photo that it has a hooked bill which, along with its long, sharp claws, is well-adapted to tearing apart the flesh of its victims. The black mask and grey plumage are distinctive features of the bird. The Great Grey Shrike was a 'lifer' for me as I've never seen one before and we've had a good year for rarities in our recording area, including the Glossy Ibis at Horwich, the Lesser Scaup at Pennington Flash and the Pectoral Sandpiper at Rumwoth Lodge. Let's hope there's more to come! We're very pleased to announce that the L.O.S. will be taking some more free guided bird walks around the hides at Pennington Flash this coming Saturday, 26th October. Please meet at the Visitor's Centre at 10am where we will have spotting scopes, binoculars and bird identification sheets for you to borrow. The walks will finish around midday. Although primarily aimed at our Young Birders' Club members, everyone is welcome to attend, but all youngsters must be accompanied by a responsible adult. Ah, remember the 90's GMTV when Eamon Holmes was thin(ner), when Mr. Motivator was keeping us fit and 'Watching' was on TV. Well here's some archive video footage about a rather special little bird that popped into Pennington Flash for a few weeks back in 1994. Thanks to our own Teresa Fayle for supplying the video and starring in it with her husband Alan, along with Peter Alker former ranger and now with the Wigan Leisure and Culture Trust and the sadly missed Roger Wood who took the photograph. Enjoy, I look forward to reading your comments below.